In this final episode I’ll talk about my impression of this mountain, the journey & photography opportunity & preparation. First and foremost, if one wanna go here to photograph its beauty, never ever go during wet season like I did. But I never regretted going to Kinabalu last Wednesday because that was the best opportunity I ever got as far as cost is concern. We spent slightly more than RM800 for the whole trip inclusive of mountain package, food, ground & air travel! During this wet season, the sky was overcast & gloomy. The light was dull & not vibrant. So difficult to get good exposure of the mountain & the landscape. Well then, it is also maybe that I need to sharpen my photography skill further. One thing that really play major factor when planning or setting package for this mountain expedition is the time you need to spend if you wanna shoot all angles & views, because, the time needed for you to reach Laban Rata is before 6PM. The time you need to be at Sayat Sayat, the last check point to summit is 4AM. The last time allowed for you to climb the summit at Low Peak is 7AM. You guide will make sure you follow that time. It is all decided by the guides. If you can convince the guides, you can override this unwritten rule. Normally I spend at least 30 mins at one spot. So go figure how much time needed at the summit to shoot sunrise & trying to get all the peaks as foreground. I arrived at KM8.5 during Fajr prayer, at about 5:20AM. I spent 90 mins at that spot because I knew I won’t get better view at the peak. I set my tripod & trying various compositions & settings. Do remember that it will be extremely cold up there. And windy too. 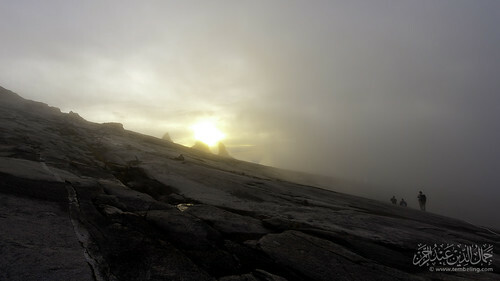 I started moving slowly to Low Peak at 6:45AM and arrived the summit at about 7:30AM. It was already very late. 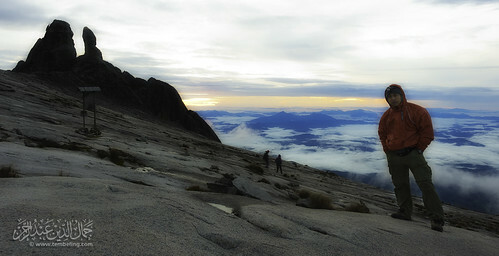 When I went up the summit, there was only me & my friend, Husni. The view from the summit is nothing compared to what I have seen on top of Mount Merapi, Mount Lawu & Mount Rinjani; all in Indonesia. By 8AM, the clouds or fog (I am not sure which is correct) already covered our view. 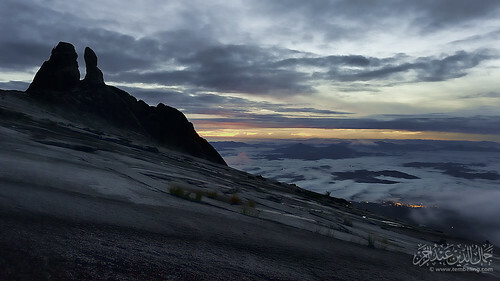 So timing when photographing at the top of Mount Kinabalu is important. I would say that if one could stay at Sayat Sayat Hut over the night, it should be great. The toilet is there but the temperature will be surely super cold. Or else, better to be able to summit 2 times. Meaning one have to plan what areas to cover in two separate days as the window period to shoot before the cloud or fog cover the sky is short. You can carry any gear you like but do get a porter. The rate is RM8 per KG up to Laban Rata. If you want to get porter to carry till the summit, the rate is even more. For a 1 time summit, just forget the tripod. You’ll use it pretty short unless you have no problem paying porter to carry it. Usually the guide will also serve as porter. The problem is, the porter won’t be able to walk with us all the time. At times they will ask you to proceed first. So, it is not an ideal situation for a photographer. Hence my recommendation to travel light. Why travel light? Because you want to be fast or at least within average time. You need to have enough rest so that your sore legs can recover a bit & you can acclimatize faster. I suggest 1 camera (with good high ISO capability) and one one wide angle zoom lens e.g. 16-35mm range. But it is up to personal preference. Is tele lens useful? Yes but for a very limited use. Therefore you can skip such lens. During my climb, I bring only 14-24mm. I left my 105mm & flash at the hotel. A good point & shoot is enough for snapshots during the hiking. Raincover is a must as we can’t predict weather change. If you wish to carry your own gear, get a good backpack. Not ANY camera bag. I used Deuter Futura 32L with Puleme’s camera insert. I reckon a good waist camera bag also OK if your camera plus the lens are light enough. The best view should be at the plateau (of cause, the east side), but not from Low’s Peak I think. Thanks to Wazari Wazir for his information, I stopped at KM8.5 instead at the peak for the sunrise view. dR Ali said sunset at Laban Rata & sunrise from Sayat Sayat was great. The landscape along summit trail also not bad especially after Vilossa Shelter. The bonsai was simply amazing. If only the sky was great! So in summary, choose dry season, travel light, spend more times at Laban Rata & summit at least twice if possible. I want to blog about something very sensitive today. Its about online photography forum. The first photography forum I stumbled upon was LensaMalaysia (LM) but later I discovered about Photomalaysia (PM). PM claimed that they are the first online forum in Malaysia discussing things related to photography. So far I never heard anyone disputed their claim & I believe it is true. My impression was that LM has more Canon users & PM has more Nikon users. Since I migrated to Nikon system, I login PM more often than others. And I made many friends in PM. I was only a silent member in LM & I don’t really know their activities nowadays. I still frequent PM eventhough I rarely post now. Later into this hobby I learnt about FMDC which is a forum dominated by Malay photography enthuthiast but it is never a Malay forum. There are few known non Malay members as well. But usually the lingua franca in FMDC is Bahasa Melayu or Bahasa Malaysia. I have many friends in FMDC, some became close friends. 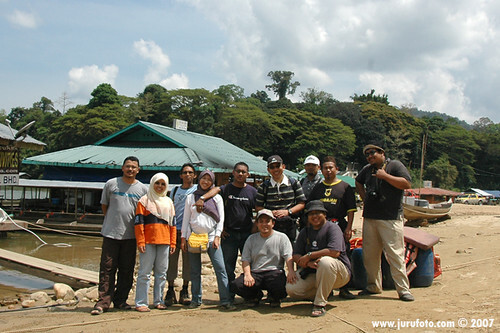 I remember the first outing I organised which was a trip to Kampung Bantal in March 2007. Initially many members wanted to join but at the end, only 11 of us going. It was me, Ali, Aji, Buntal, ND, Butet, Kingmarul & wife, Azizi & wife and my friend Dr Azizi. Thanks to Aji & his effort on sponsorship, all of use got a good Deuter bag. I really enjoyed the trip. We felt closed to each other. I treasured the friendship created. In 2008, we went again. 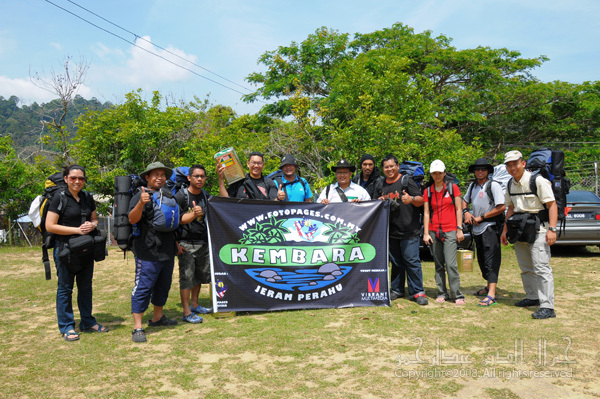 But this time further up to Jeram Perahu. Again, I enjoyed the trip and the friendship. I managed to get small sponsorship in the form of cash to buy logistics supply especially for the Orang Asli but no bag this time. My point here, I got many friends who love photography tru these forums. Having said that the forum, regardless PM or FMDC getting big & bigger. More people interested in photography, everyone want to have SLR and many join in the forum. Some join the forum first with compact camera (especially in FMDC) and later upgrade to DSLR (I remember Butet did wedding with some royal guest using Lumix only ). There are many information in these forums but when there are too many ideas, many philosophies, some members opted out & form their own forum. I won’t name the forums. Some manage to create new direction with their ideology & style…..some just die off. Now, my opinion on this matter. Regardless where you come from, who you are, what is your idea….please remain as friends. Respect people. Don’t shout, don’t call names. Just behave like any civilized community (unless we believe we are not!). I don’t think we should own anyone. If anyone want to create their own forum, let them be. Guys, this is why we are not united. Let people choose where they want to go. What they want to do. Don’t become to obsess with one group & belittle the others. If you have a group, fine. You may have your own idea. Just don’t say bad things about others. We own nobody! If we regard the knowledge we share as charity, we should allow people to use the knowledge. If they transform the knowledge to be something of their own style, let it be. Why should we claim everything we contributed? Don’t ‘worship’ certain people. That’s the beginning of idiolism & idols in the past. No one is better than the rest. Azazil became Syaitan because he said he is better than Adam. We will always have weakness because we are not God. In Islam if you don’t want to speak with another fellow muslim for more than 3 days, your amal won’t be lifted to the sky. So friends….let’s be friends again….. I bought SLR because my Sony Cybershot was not able to give me good picture of my arowana. My first SLR was Canon 300D. Bought it from Syahrin Aziz. The body alone cost me RM2K plus. Can’t remember the exact amount. Apart from shooting arowana, the next ‘genre’ that I felt in love was macro. I started with reversed 50mm. There was no Raynox at that time.It was very very hard to shoot with reversed lens. It was very very dark & I had to focus manually. Having said that one of the daisy taken with such technique accepted for the publication in Digital Camera Magazine. I also used 4+ macro filter even earlier than that i.e. the time I had Canon 300D & 50mm lens. But I sold everything to a young college student & jumped to Nikon at the time when Nikon D70s appeared in the market. My macro stopped at using reversed lens only. Then I moved to shoot using telezoom. I loved to go to the zoo to shoot animals. I bought 55-200 lens than later a 70-210 f4 lens but I was never satisfied until I got myself 105mm f2.8 & 80-200mm f2.8 somewhere in 2006. I still remember, I bought them together when I went to UPM for a tennis tournament. I also love doing CLS (Nikon’s term for wireless creative lighting system). In fact it was one of the reason I bought D70s back in 2004-2005. I wanna shoot my arowana dancing in her tank with the lighting coming from above. Quite recently I began shooting landscape & had been to many places just to shoot beautiful scenery. Shooting animals in the zoo or waterfall in famous tourist areas become less interesting. I prefer the real nature. And the place with few people. I have been to volcanoes in Indonesia, fierce rapids in a very remote area of Ulu Tembeling and a jungle in Raub. And you guys can see them all in my flickr or gallery.